Breaking news... I'm putting up my second Kickstarter campaign very soon. This is me in a screen grab from some test shoots yesterday and today. There were two other locations tested but this one has the best feel and natural lighting for this particular campaign. I'm really excited about this project and can't wait to share the news. Attention awesome backers of End of the Innocents: you will be receiving the link to the new campaign 24 hours before it goes out to everyone else. Start checking your email inbox early next week for your notification. Yay! The JOTRH trailer has just made its exclusive debut on Entertainment Weekly! 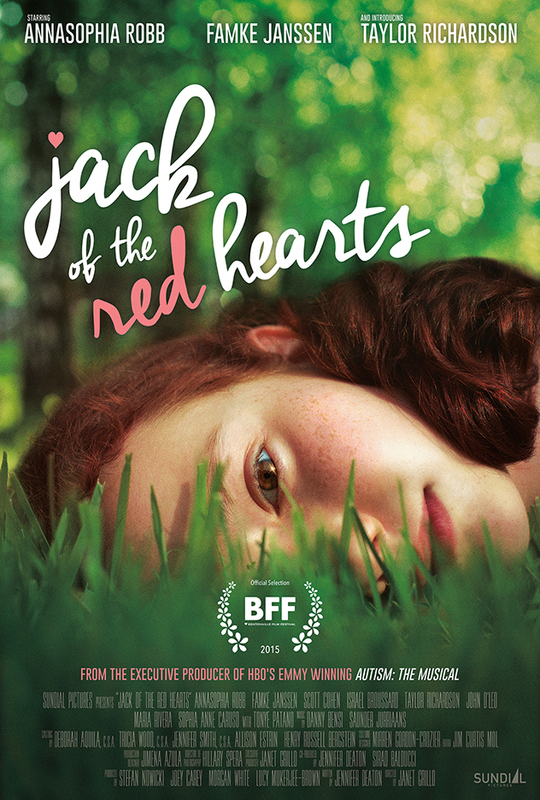 Check it out and see when and where you can see Jack of the Red Hearts in a theater! Click the photo to get to the trailer. It was a year and a half ago that I shot some of the production stills for the independent feature, Jack of the Red Hearts. While the movie was getting all kinds of awards on the festival circuit, I was honored that the production chose to use a photograph I took of Taylor Richardson on the poster. I'm very pleased that AMC is using it for the theatrical release. I might be the only person on the project that hasn't seen the film yet. There have been some screenings I was invited to but each time I was on the opposite coast. So you will see me at one of these theaters. The movie stars AnnaSophia Robb (Carrie Diaries), Famke Janssen (X-Men), Taylor Richardson (Annie (on Broadway)), Israel Broussard (The Bling Ring) and Scott Cohen (Allegiance). If you're close to any of these locations, please support independent filmmaking and see Jack of the Red Hearts in a theater! The release date is February 26, 2016. I've come up with yet another way to choose the subject matter for my daily blog. One hundred and nine days so far this year. I have not missed a day. It can be difficult to find something new to write about. I like the challenge of it. The only posts I know I'm already doing are the birthdays and deathdays of all the musicians I shot who have passed away. That takes care of 96 days plus 2 for each musician that has passed after the book came out. So, I've come up with yet another fun way to inspire me to post. This time I searched for all my photography files with the frame number 0419. It came up with five different photographs. When I checked them out, I didn't particularly love any of them. That's when I decided to critique my work. This should be fun. What I like? - My favorite thing in this picture is the way the horse's back hooves are completely planted in the dirt. His stance is perfect - that's hard to do. What I don't like? - Everything else. If I could do one thing I would have used a more open f-stop so that everything but the horse and rider would not be in focus. This was shot at a boat party on the Hudson River. The music was crap and too loud. I did manage to get some good shots. Sadly, this wasn't one of them. I had made some crack at him and he made this pose and I grabbed the shot. What I like? - The guy's shirt and tattoos. What I don't like? - My shutter speed was too slow so there is slight motion which softens the focus. I would have preferred everyone in the background to be soft focus, with my subject sharp. What I like? - This was an awesome moose. She was a real ham. It's cool that I have two jumping animals with the same file number. What I don't like? - While it's very cool that I caught the moose jumping a fence, There were other photos in this series that are much better. It needs to be more arty. I took this at the Harmony Festival in Northern California. What I like? - I love the relationship between Charlie Musselwhite and his guitar player. It tells a story. I also like the up angle, and how they look as if they are leaning toward each other. I thank the 24mm lens. What I don't like? - It could have been better. This is Ryan Coogler. He was in his very early 20's when he wrote and directed Fruitvale Station. He's now 28 and is in post production on another movie he wrote and directed called Creed, starring Sylvester Stallone as Rocky Balboa where he mentors his nemesis's (Apollo) grandson. What I like? - Him. He was sweet and smart so I took a pic with my phone. I like the composition and the moment. What I don't like? - I wish I had taken it with my 35mm camera. This one's a bit too grainy.